WHITECHAPEL, hailing from Knoxville, Tennessee, played a show this past week at The Door Clubs in Dallas, TX on their headlining Our Endless War Tour, promoting their newest album release of the same name, out now on Metal Blade Records. Let me just get started by saying that WHITECHAPEL has been and probably is still my favorite band in the Deathcore genre. Their performances always exceed expectations and blow me away. The sheer talent of Ben Harclerode on the drums is insane, and same can be said for all of the instrumentalists. 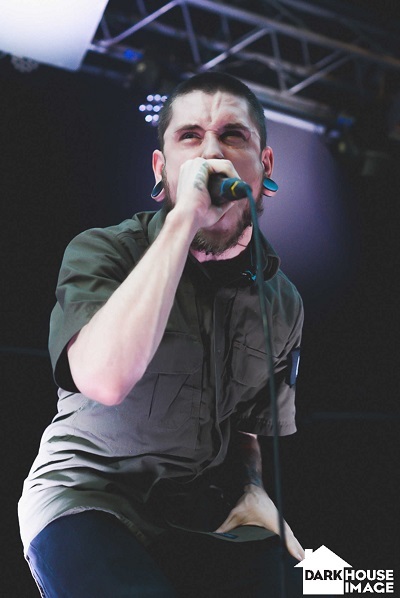 But the main reason why WHITECHAPEL is my favorite band out of this genre is 100% because of Phil Bozeman. He is an INCREDIBLE harsh vocalist. From lows, mids, and to highs, the man is virtually flawless. Every time I have seen them, his vocals are on point, and there was no time throughout the shows where I doubted that. At this gig on Monday, they started off with a bang, playing title track “Our Endless War,” a very, upbeat and energizing song to get the crowd going. After the opening, they played another one of the new songs (and The Maestro’s favorite!) “The Saw is the Law”. This track is one of my favorites out of all of the new ones because of its catchy chorus and hooks. It is so cool hearing all of the fans shouting the lyrics along with the band on the verses and choruses. The main lyrics “Where we come from, the Saw is the Law, when there’s no hope left, we will not fall, among the giants, we still stand tall and we will not be stopped” for example, sends chills down your spine with its aggression. They played a few of their classics as well, such as “Prostatic Fluid Asphyxiation”, “Vicer Exciser” and “Possession.” The crowd went nuts as expected, and it was awesome! I was in the pit for these songs and was very bummed when I had to leave to get some water. It was great fun. They also played another song off of the new album called “Worship the Digital Age”. This is another one of my favorites because of how cool the effects in the song are. The intro is a very condensed crackling noise, almost resembling the start-up sound on old computers, accentuating the song’s title, and after that, the guitars come in with heavy distortion. The venue’s sound however, I did not like. The treble was turned up way too loud and everything overpowered the vocals volume-wise. But other than that the venue was good. The crowd was very responsive to the band by singing along to the lyrics and such, but the pit was pretty much dead throughout the show. There was, however a golden moment during the performance where WHITECHAPEL asked the crowd for a Wall of Death during their song “Mono”. It was pretty good considering how dead the pit was prior but it was nice to see a glimpse of how WHITECHAPEL crowds from shows I’ve attended in the past were. The highlight of my night though was their encore song “Diggs Road”. The story behind this song tugs at my heart strings, talking about not being able to get over parents’ death, with strong lyrics that pierce through your core. I recall me and everyone in the venue screaming the lyrics along with Phil. Overall I think this concert was pretty good, but past shows have been better. Still…this time, and like all the other times before, they never disappoint.